The Jefferson St. Credit Union Building is a skyscraper in Liberty City in Grand Theft Auto III, Grand Theft Auto Advance and Grand Theft Auto: Liberty City Stories. With the height of 437,6 m (1433,7 ft) it is the tallest building in Liberty city, and also the second tallest in the entire GTA III Era. It is owned by the Jefferson Street Credit Union, and it is connected to two other large commercial buildings. View of the square, with the building of Morningstar and the Jefferson Building in GTA Liberty City Stories. The Jefferson St. Credit Union Building is located in Staunton Island at the district of Torrington, in the same block, as the Morningstar Building, and it's plaza. 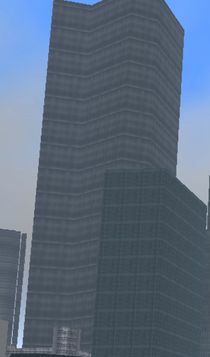 The building was partially constructed before 1998, and between 1998 and 2001 it was extended to become the tallest building in Liberty City, surpassing the Empire State Building equivalent . The building is connected to two other large commercial buildings, one owned by FCB Bank and one by AmCo by skyways. A Hidden Package is also located (behind the figure of space) here in GTA III. A Hidden Package is also located off the "exit" of skyscrapers here in GTA Liberty City Stories. The Jefferson St. Credit Union might be based off the World Trade Center, however it is even taller than the WTC towers, which stand at 1,368 ft (417.0 m) minus the antenna. On the other side, the design of the building bares resemblance to 101 Park Avenue. Jefferson Street Credit Union is probably a credit company or society as the name describes, it also as a bank. The company or firm is not well known, but is characterized by having to host the tallest building in the city. Main entrance of Jefferson Building in GTA Liberty City Stories. This page was last modified on 12 March 2017, at 15:30.